Below is the rush transcript for "This Week" on February 23, 2014 and it may contain errors. RADDATZ: Hello again. I'm Martha Raddatz. Great to have you with us. We're tracking breaking news this morning, the capture of the man some call Mexico's Osama bin Laden. One of the most wanted criminals in the world and the top illegal drug dealer in the U.S. -- drug lord Joaquin Guzman, known as El Chapo, or Shorty, became notorious for his global empire, his ruthless reputation and his legendary ability to elude police. That is until this weekend. ABC's senior justice correspondent Pierre Thomas is here with us now with the latest -- Pierre. PIERRE THOMAS, ABC NEWS CORRESPONDENT: Good morning, Martha. You can't overstate what a huge figure El Chapo is -- so vicious, so innovative, so crafty. There are even suspicions today that he may have changed his appearance through plastic surgery. THOMAS: It was a stunning sight, the most powerful drug lord in the world in handcuffs after more than a decade as a wanted man. Law enforcement's long quest to capture Joaquin Guzman ended at this hotel at 6:40 yesterday morning. Mexican authorities acting on intelligence from American immigration and drug enforcement agents arrested him on the fourth floor of this hotel in the resort town 600 miles from Mexico City. Guzman's criminal resume infamous, thought to be responsible for 25 percent of drugs entering the U.S. Controlling an astounding 80 percent of illegal drugs on the streets of Chicago. So rich he made the Forbes Magazine billionaire's list. So vicious, that nearly 80,000 people have died in drug related violence in Mexico, and that's not including so many more from drug overdoses. El Chapo bribed his way out of prison 13 years ago, escaping in a laundry basket. He always seemed one step ahead of authorities. Just a week ago, he evaded capture with an amazing getaway from police through a network of underground tunnels. UNIDENTIFIED MALE: He has a lot of protection around him, both his security guards and people that are willing to protect him, because he has a lot of money and assets to throw around. THOMAS: He was part of a cartel network creative in their smuggling -- submarine, boats, airplanes. A yearlong Univision investigation, reported by our sister network Fusion, revealed how it worked. UNIDENTIFIED MALE: From an 18-wheeler to aircraft to U.S. Mail, UPS, FedEx, to the trunk of a car to the backpack of an 18-year-old riding a bus. Chapo does not play by the rules. He has unlimited resources. UNIDENTIFIED MALE: You got what you were looking for. THOMAS: I saw firsthand how cartels operate at the southwest border checkpoint. A truck of furniture was actually hiding more than a ton of marijuana. There are so much drugs coming from Mexico, it has to be destroyed at secret locations like this. The Mexican cartels have turned parts of that country into a war zone. And Guzman was perhaps the most ruthless, often compared to Colombian kingpin Pablo Escobar. UNIDENTIFIED FEMALE: You see all this chaos and all this destruction and death and come from this one guy. You go, oh my god. THOMAS: He faces multiple indictments in the U.S., but will the Mexicans ever really let him go considering all those dead people in that country, Martha. RADDATZ: And that is quite a question. Pierre, thank you. And stay right there. We'll be back to you in a moment. We're joined now by the chairman of the House homeland security committee Michael McCaul. Congressman McCaul, can you please tell us the enormity of this arrest. What does it really mean to the average American. MCCAUL: This is a significant victory for both Mexico and the United States. This is the world's most notorious drug lord that got taken down. He's really the Godfather, if you will, of the cartels that has brought -- smuggled so many drugs into the United States, killed so many people in Mexico and around the world and to bring him to justice, finally, after so many decades is a great victory. And I do want to take a chance to applaud the ICE agents, the DEA agents who worked this case and also the Mexican authorities who have stepped up to the plate and showed great cooperation with the United States make this happen. This is a huge event, it's sort of like, you know, again the Godfather, the Al Capone of Chicago. In Chicago, he's the number one enemy. And it would be similar to Pablo Escobar in Colombia being taken down, after which the drug cartels began to unravel. RADDATZ: Well, given what you've said, Chairman McCaul, the Mexican ambassador to the U.S. said that he thinks it's important that Guzman first be tried in Mexico. Would you like to see him extradited to the United States? MCCAUL: I would. I think the normal sequence is the Mexico being a sovereign nation has the first prosecution. However, there's a history here. He escaped from a prison in 2001. There is corruption in that country. And I would ask that the Mexicans consider extraditing him to the United States where he will be put in a supermax prison under tight security where he cannot escape and be brought to justice with a life imprisonment sentence. I think that would be the best course for not only Mexico, but also the United States in ensuring that what happened in 2001 does not happen again. RADDATZ: And what's the likelihood of that happening. And I can see why you would feel that way, because he escaped from prison 13 years ago. What's the likelihood that they would allow him to come up here in a supermax prison? MCCAUL: Well, I think it depends on how much pressure our State Department, quite honestly, and our administration puts on the current administration to do this. You know, I think their preference, again, would be to try him first in the United States. But the track record is not good with this individual. This is an exceptional case, you know, this is the largest, biggest drug lord we've ever seen in the world. And therefore I think extradition to the United States, where there were multiple indictments in multiple cities -- San Diego, New York, in Texas and Chicago -- where we could deal with him in a secure, safe way and bring him to Justice. And one final point I think it's important to make, there are early criticisms on this administration in Mexico that they were going to be soft on the cartels. And I think what has happened here is very significant in terms of the cooperation with Mexico. President Pena Nieto has demonstrated that he is tough on these cartels. He brought out the Los Zetas leader who is arguably the most lethal cartel and now the biggest fish ever, and that is El Chapo Guzman. RADDATZ: OK, thank you very much Chairman McCaul. We appreciate you joining us. RADDATZ: Let's bring in our experts now. Pierre is back with us along with David Aguilar, the former Customs and Border Protection commissioner who for more than a decade you tracked Guzman and investigator reporter Marianna van Zeller from our sister network Fusion who has covered Guzman extensively. I want to start with you commissioner. You had what they call an intimate intelligence relationship with Guzman, which means there was not a day that went by in your 10 years tracking him day and night. Just your reaction to having him captured, when you heard that. AGUILAR: Martha, Pierre, first of all thank you for having me this morning. And the reaction was one of relief -- one of relief and tremendous achievement on the part of our Mexican friends and neighbors to the south. The fact that they were able take him down the way that they did by not firing one shot, that tells me that the intelligence, the tracking, the operationalization of that intelligence that we had done for so many years was carried out in exactly the way that we all hope and pray that these thing go down. RADDATZ: Tell me a little bit about what that was like during those 10 years? How you did it, how you track them, what the communications are like? AGUILAR: Well, the communications are critical, especially between the law enforcement entities and agencies involved, both domestically and internationally. In this case, it was Mexican assets that actually took the frontline, took the point on this situation. When this happened, the intelligence all came together. They were able to make it happen with office of safety as a primary perspective. RADDATZ: Marianna, I want to turn to you. Why was Guzman so successful as a drug lord? What did he do differently? MARIANNA VAN ZELLER, INVESTIGATIVE JOURNALIST: Well, this is a guy who in less than a decade was able to transform a startup operation into a multinational criminal organization. I mean, he was business minded, business oriented. He was creative -- submarines, tunnels, you name it, he figured out news ways of bringing drugs into the United States. VAN ZELLER: In Chicago -- submarines, indeed, and tunnels -- I got to visit one of these tunnels and it was quite amazing. I mean, 60 feet down, 700 feet across connecting the U.S. to Mexico, everything from ventilation to electricity was -- took over $1 million to build over a year. And law enforcement told us that it would take about a month to make all that money back, just from the drugs being taken here into the United States. RADDATZ: And this would really hurt. He really focused on Chicago. VAN ZELLER: Absolutely. Chicago has the fourth or fifth largest Mexican population outside of Mexico. And it is sort of the ideal center, distribution center, to have drugs, uh, shipped across the Midwest. And pretty early on, in 2006, he decided he wanted to make Chicago his distribution center, even though it's alleged that he's never actually stepped foot in the city. RADDATZ: Was there any time, Commissioner, that you came close to catching him? AGUILAR: There were several times. There were several times that, actually, the international law enforcement community came close. But a very cagey individual, an individual that had a tremendous amount of support and infrastructure built up to escape and evade. Now, one of the things that is absolutely critical here is that the relationship that has been built up between Mexico and the United States over the last decade is what got us to where we are today. Now, we must bear in mind that there will be an effort to fill the void left by this -- by this individual. The fight will continue. We are not finished. But that relationship is absolutely critical and foundational to continue to impact on these international criminal organizations. RADDATZ: Which is exactly what I was going to ask you, Pierre, who fills that void? How quickly is that void filled? How long does this disrupt? THOMAS: He has a number of lieutenants and rivals who will try to take care, uh, fill that void. But one official told me yesterday, you have to think of these cartels as major corporations. In other words, if the head of McDonald's was captured or taken off the grid tomorrow, they'd still be flipping burgers. So they're still going to be trying to make and sell those drugs into the United States. RADDATZ: And -- and how fast do you think the void is filled? AGUILAR: The effort is ongoing now. It is happening as we speak. But what this brings to the international law enforcement community is a point of vulnerability. We must exploit the vulnerability that now exists because of this head of the snake being cut off. This was a tremendous success, a tremendous achievement. I can guarantee you that the international law enforcement community is celebrating what our Mexican friends did. RADDATZ: And it will probably have an impact on crime in Chicago. I certainly hope so. Now, switching gears to another big story this morning, the last day of the Sochi Olympics. An impressive two weeks for U.S. athletes. ABC's Matt Gutman has been covering the Games for us -- good morning, Matt. MATT GUTMAN, ABC NEWS CORRESPONDENT: Good morning, Martha. This morning, the U.S. is in second place atop the leader board. The Games capped by the U.S. bobsled four man team taking a Bronze a short time ago in spectacular style, coming from behind. But it's the home team that now sits atop the medal board. Russia with 33 medals. These have been called the Security Games. We've heard so much about the ring of steel -- tens of thousands of troops and police clamping the region in an iron grip. And so far, not a single incident that we've heard of at the Olympic venues. We've seen a lot more nylon ski get-ups than Kevlar. And in just a couple of hours, that flame you see behind me will be extinguished. Expect an extravagant but more muted closing ceremony than the opening ceremony, heavy on Russian history and, of course, the passing of the torch to the Koreans, hosts of the 2018 Games -- Martha? Now, new details on a drama so intense, Russian President Vladimir Putin took time away from the Olympics to discuss it with President Obama. A high stakes conflict just 300 miles from Sochi in Ukraine, where the parliament just voted to strip the president of his powers after a peace pact ended days of violence. Is a tug of war between Vladimir Putin and the West, so critical because of Ukraine's key location. Take a look. It's a country torn between East and West, with opposition protesters looking toward the values of Europe on one side, while supporters of the Ukraine president point to Putin's Russia. ABC's Haimish Macdonald is on the ground in Ukraine's capital and joins us now with the very latest -- Haimish. HAIMISH MACDONALD, ABC NEWS CORRESPONDENT: Martha, the ousted president, Viktor Yanukovych, is calling this whole process a coup. And then just hours later, was prevented from leaving the country on a helicopter. Take a look at these pictures. They're being broadcast on local independent television. They claim it is security footage of him trying to escape, but they can't independently verify that it is, in fact, him. In the meantime, the parliament is trying to assert its own authority, appointing an acting president, the speaker of the parliament, as well as that releasing the archrival of Yanukovych, Yulia Tymoshenko, the former prime minister. She's been in prison. She has back problems now and is in a wheelchair. MACDONALD (voice-over): As a power vacuum opens up, the sworn rival, Yulia Tymoshenko, enters center stage. She began the day a prisoner and ended a key player in this country's future. Tymoshenko is not universally admired here, but they shout approval when she vows justice for the ousted president. A swift session of parliament agreed to release the former prime minister, leaving her daughter in tears. They voted, too, to impeach the president and hold fresh elections in May. Outside, protesters are in control, guarding all key government buildings and roaming the abandoned presidential retreat. It's thought to have cost some $500 million. UNIDENTIFIED MALE: I can't believe that such -- such a place can exist in Ukraine. MACDONALD: The average person here earns less than $15 a day and the country has huge debts. So this zoo (ph), the cars, are unthinkable. They now hope the next leaders will be more honest. MACDONALD (on camera): But are they corrupt? KURKOV: I -- we don't have clean politicians, especially in the parliament. MACDONALD (voice-over): Andrey Kurkov is Ukraine's best loved author. He's already writing about this latest bloody chapter in the country's history. (on camera): Why was it worth killing people to keep power? KURKOV: Itmenski (ph) didn't consider people in the streets his people. They were the enemies. MACDONALD (voice-over): There is much at stake here for world powers. This past week should have been Vladimir Putin's finest hour. Instead, on his own doorstep, protests gave way to running gun battles. (on camera): How much is this about Russian influence versus Western influence? KURKOV: Now, it is very much. Putin's so-called Russian world will not exist without Ukraine. Ukraine, I mean Kiev is the first capital of -- of Asian Russia. MACDONALD: So how disappointing is this for Vladimir Putin? KURKOV: I think -- I mean if I was him, I would drink all night. MACDONALD (voice-over): Toppling Lenin's statues are evidence of long held desire for distance from Moscow's influence. But in the Russian-speaking east, those bonds remain tight. In this deeply divided nation, the biggest challenge may just be remaining united. MACDONALD: Martha, quite apart from who wins the battle for international influence here, whoever emerges as the next leader has the challenge of trying to keep this country united, prevent it splintering into two, possibly three, different countries. And perhaps crucial to doing that will be dealing with, immediately, the debt crisis that Ukraine is now in. RADDATZ: Thanks so much, Haimish. Tom Friedman is the foreign affairs columnist for "The New York Times" and author of "From Beirut to Jerusalem." And we also welcome back our ABC News contributor, Bill Kristol, who is also editor of "The Weekly Standard." And Tom Friedman, I want to start with you. You have Ukraine's president, who has virtually vanished. He's now trying to rally his supporters. However, new elections, protesters feeling they have a victory. What happens next in this country with no money and no unity? THOMAS FRIEDMAN, COLUMNIST, "NEW YORK TIMES": Well, I think the good news, Martha, is the fact that this happened from the bottom up. The West didn't do this. The United States didn't do this. The EU didn't do this. The Ukrainian people did this. That's, I think, very, very important to remember. but what do we learn from experiences like Egypt, for instance, where we also saw bottom-up ousting of a -- of a long-time dictator? FRIEDMAN: Right. It's -- it does at -- at many levels. A failing state, but also what we learned from Egypt is it's not about the morning after, it's all about the morning after the morning after. The morning after, everyone celebrates getting rid of the leader everyone hated. But what you discovered in Egypt was actually there was a huge diversity of opinion of where to go next, what they wanted to be free to do. And I think we're going to face the same challenge here in Ukraine. The second big challenge is, just like Egypt, is an economically desperate state. And, you know, when you win Ukraine, you win a bill. RADDATZ: Bill Kristol, bottom-up, is -- is that a good path? What happens now, in your eyes? BILL KRISTOL, EDITOR, "THE WEEKLY STANDARD": Look, 10 years ago, there was the Orange Revolution in Ukraine. I mean it was one of the first color (ph) revolution in spite of other efforts around the world, in Lebanon and, ultimately, perhaps, even in Tehran and Damascus. So all honor to the people of Ukraine for -- for having -- that -- that first revolution, unfortunately, slipped away. I think that's partly our fault, incidentally, in the U -- and the West Europeans fault. We didn't do as much as we could have to help the newly democratic Ukraine. It was very corrupt, oligarchs have facilitated the corruption. Putin did not help at all. And so we ended up where we were. And now the people of the Ukraine have done it again. And now, I do think it's bottom-up, which is great. I totally agree with Tom on this. George Washington, whose birthday it was yesterday, said liberty, when it begins to take root, is the plant of rapid growth. And I think liberty is a plant of stronger growth. And people sometimes, like us in the West, think, you know, in the -- once that spark is there, people remember it and they want it back. But we now need to help them. RADDATZ: We can't avoid Russia's role here, as you mentioned. What Russia does next is so key. Here is what President Obama said that -- about that this week. BARACK OBAMA, PRESIDENT OF THE UNITED STATES: Our approach in the United States is not to see these as some Cold War chessboard in which we're in competition with Russia. Our goal is to make sure that people of Ukraine are able to make decisions for themselves about their future. RADDATZ: Of course, Yanukovych was democratically elected. But is this a new version of a kind of Cold War here? FRIEDMAN: Well, I don't think this is a Cold War, Martha. A Cold War is a very specific thing, two nuclear armed powers and competing ideologies truly playing on a global chessboard. I would -- I would argue the world is really divided up into three kinds of states right now, my co-author, Michael Mandelbaum, and I've been talking about this. One is countries that are focused on having a powerful state. That's Russia. And if you've got oil, that's Iran, that's North Korea. If you've got nukes, you can just focus on having a powerful state and playing your geopolitical games in your neighborhood. Second are states focused on having a prosperous people. That's the European Union; that's the world that many Ukrainians want to join, clearly. And third are states who are fighting over something very primal, who are we, what are we. That's Syria, who owns which olive tree. And in many ways, Ukraine is all three. You have, you know, part of it, Russia, competing for wanting to pull it into its powerful state sphere funded by oil. You have Ukrainians wanting to be part of the world of globalization, the I.T. revolution, economic growth and opportunity. And you have a state that still doesn't -- isn't sure about its identity in a post-Soviet, post-Cold War world. RADDATZ: But Russia is in danger of losing a key ally here. Is there any danger that Russia does intervene, that they might even send in troops as they did in Georgia? KRISTOL: -- years. But it could do even worse. So, look; it's nice for President Obama to say it's not a Cold War chessboard. I don't know why he says that with some disdain. That was not an ignoble thing for us to play on that chessboard for 45 years. We ended up winning that Cold War. And I do think Putin thinks he's playing chess. He thinks he's playing even a rougher game than chess and we have to be able to match it. We could say we're all honored at the people of Ukraine for beginning this process but that we are not as -- we and the Europeans cannot make ourselves as strong a force for democracy and rule of law in Ukraine as Putin is for the opposite. Then things may not go well. RADDATZ: I want to move to Syria. You mentioned Syria. The U.N. Security Council voted to boost aid to Syria this weekend. But that conflict grinds on. There's been talk about perhaps new options in Syria. Is there anything more than can be done here, Tom Friedman? FRIEDMAN: Well, you know, clearly if we can identify people who truly share our values of a -- wanting to see a pluralistic, you know, consensually political Syria, I think we should arm and support them and it seems to me the administration is doing that. But, you know, I'd ask you, Martha, can you name the head of the Syrian opposition? RADDATZ: I knew you were going to ask me that. RADDATZ: I can name several. FRIEDMAN: -- and this is -- no, this is -- I actually can't. And that's really one of the problems. I think a lot of people in Syria, you know, sometimes the news is in the noise and sometimes the news is in the silence. And the fact that so many people are still clinging to Assad has to do with the fact that they do not see an opposition right now that has the real ability -- and maybe even the ideology to build a pluralistic Syria on the ground that's, say, the Christians who are still clinging to Assad and the Alawites, you know, would feel confidence in. So you know, I want to come back to Ukraine just for a second and to another similar revolution, Tunisia. Why is it that the Arab state that's done the best is the one we had the least to do with? Because the people took it and they owned it. And did we see that in Syria? Man, I'm all for supporting it. But it's got to start with them. The Middle East only puts a smile on your face when it starts with them. KRISTOL: Iran did not intervene in Tunisia and you need to support your friends; they can win your enemies through being supported by outside powers, which I think is the case in both Ukraine and Syria. Syria was also a bottom-up revolution, a peaceful revolution, a pro-Western revolution to an amazing degree. Back in 2011, we did nothing. RADDATZ: So, Bill Kristol, step back for a moment here quickly and look at what Barack Obama's foreign policy legacy is up to this point, with Syria, with Ukraine, with Libya, with Iraq, with Afghanistan. KRISTOL: With Iran, people around the world, I think, will want liberty to an amazing degree. And we've done very little to help them. RADDATZ: OK. Thanks to both of you. We're just getting started. Up next, Facebook shells out $19 billion for a text messaging company with only 55 employees. Is it worth it? What will be the impact on your wallet? Plus the powerhouse roundtable on all the week's politics. Should Americans get a raise? Who wins and who loses if there's a minimum wage hike. And later, our revealing conversation with President George W. Bush, back with all that and more in just two minutes. RADDATZ: Now to a blockbuster tech deal, Facebook is expanding its empire. UNIDENTIFIED FEMALE: What a deal this is. Facebook is buying WhatsApp for $19 billion, its largest acquisition every. UNIDENTIFIED FEMALE: Breaking news: Facebook pays a jaw-dropping $19 billion for an app -- an app. RADDATZ: Back now with that story that shook up the tech world and had many of us asking is a tiny text messaging company with no profits and only a few dozen employees really worth a $19 billion? Facebook thinks so. Here's ABC's Rebecca Jarvis. REBECCA JARVIS, ABC NEWS CORRESPONDENT: Why is Facebook paying Jan Koum and Brian Acton $19 billion to join the social network? Because they created WhatsApp, a five-year-old business with just 55 soon-to-be very wealthy employees. WhatsApp lets users unlimited text messages anywhere in the world. The app saved consumers nearly $33 billion in texting fees last year alone. What does Facebook get from this deal? UNIDENTIFIED MALE: If someone (INAUDIBLE). I mean, superficially, they get all -- about 450 million users of WhatsApp. They say that WhatsApp is going to grow to more than 1 billion users, which is huge. JARVIS: At $19 billion, it's the biggest startup buyout of all time, the biggest Internet deal since AOL bought TimeWarner, $18 more than what Facebook paid for Instagram in 2012. It also makes tiny WhatsApp more valuable than some of the most established companies in the country, including American Airlines, Marriott Hotels and Xerox. WhatsApp doesn't do advertising; they don't collect a lot of user data. How does Facebook make money with this company? UNIDENTIFIED MALE: Mark Zuckerberg basically said we don't know yet. JARVIS: The deal does give the world's largest social network another dominant mobile communication tool, one that's particularly popular with young and international audiences. UNIDENTIFIED MALE: Instead of buying these upstart social systems, they need to figure out ways to create them by themselves so that they don't have to keep spending $20 billion on each new one. JARVIS: For THIS WEEK, Rebecca Jarvis, ABC News, New York. Back now with the group, including Cory Johnson, anchor of Bloomberg West, who joins us from San Francisco. And, Cory, I want to start with you; Facebook, as we've now heard, has spent $19 billion on this, I think $20 billion in the last two years to acquire these barely profitable companies. Explain further why they're doing this. JOHNSON: Well, look, on some level this is still a mystery. I mean, Mark Zuckerberg is addressing the Mobile World Congress in Barcelona. And it's such a big deal, they have so many questions about this valuation, we're actually going to carry it live tomorrow because people wonder why spend this much money on such a nascent application that seemingly came out of nowhere. But I think what Facebook recognizes how rapid change is happening in this world of mobile computing. And WhatsApp has had great success where Facebook has only begun to have minor successes. RADDATZ: Tom Friedman, you wrote a column this month about "Start-Up America," and how Silicon Valley is where you say "ideas come to launch and Washington, D.C., is where ideas go to die." So what does Washington learn from Silicon Valley? FRIEDMAN: Well, you know, one of the biggest things you can learn, I think, Martha, is that in Silicon Valley, when you call someone a collaborator, that means it's someone you're building something great with. When you call someone a collaborator in Washington, it's used in the Vichy French term of someone from the other party you're working with. So certainly there's a message there. Look, I think what we're seeing here, to take it back to our Ukraine story for a second, is the world is going from connected to hyper-connected now. And what that does is that it concentrates wealth at the top. It distributes power at the bottom. And it injects transparency everywhere. And WhatsApp, which actually came across for the first time two months ago I was telling Bill, in Saudi Arabia, when someone said, I'm going to WhatsApp you, and I didn't even know, I said, what's WhatsApp? You know? RADDATZ: And there is that Ukraine connection because one of the founders was from Ukraine. And he didn't like that police state atmosphere. And he didn't like being followed around. And you don't do that on this app, correct? KRISTOL: Right. And you know what? It turns out to found a company like WhatsApp or to found Facebook, it helps the rule of law, it helps to have a pretty free and open market, it helps to have free capital markets, which allowed Mark Zuckerberg to decide to pay his own shareholders money, not government money, for this company. So I do think it makes a very common-sense point. You ask about the contrast with Washington, the common-sense point is you want to have fairly free markets out there. That's where the innovation comes from. RADDATZ: ... 55 employees, that's one small corner of a factory floor. Let me take this to Bill Kristol and we'll come back to you, Cory. Should we be worried that our biggest growth sector is made up of these elite few? What does this say for growing jobs? KRISTOL: It says that other, more traditional sectors, energy and manufacturing, should be deregulated and let go free a little more. Where is the growth coming from? It's from the least regulated, least unionized, least focused on Washington, least (INAUDIBLE) capitalist part of the economy. RADDATZ: And, Cory, you wanted to jump in there? JOHNSON: Well, I think, you know, that the success of this app has a lot to do with cost, right? They've been able to use technology to find ways around the cellular networks. You know, in other countries it can cost as much as 25 cents to send every single text message. So you saw WhatsApp really explode. It is the number one app used for social -- for text messaging, if you will, in Mexico, in Brazil, in Indonesia, in some of the biggest countries in the world. Not in the U.S., but it is growing fantastically. But the reason it's growing is they don't charge anything. So from a business standpoint, you know, you can look at the success of it on a social aspect or on a technological aspect and be just floored by it. But when you look at it from a revenue standpoint, because they don't charge, they're successful. But because they don't charge, it might not be a great business. So when Mark Zuckerberg and Facebook are spending so much in stock, and a great deal of cash to acquire this company, in some ways it's a very much a defensive effort against something that's free, when they want to find some way to make money on these things, and the inventors of this device or this application have not been able to yet. RADDATZ: ... $19 billion on this. JOHNSON: Yes, go ahead, Tom. FRIEDMAN: You know, and I was going to say that, that's scary, but what is equally scary is the fact that only 55 people work there. And I think that is part of a larger trend. In fact, if you took probably Twitter, Facebook, even Google, and WhatsApp, Instagram together, you could probably fit them all in the new Giants Stadium, you know? And yet these have huge multiples. And I do think that is a trend. That machines are -- and software will increasingly be substituting for a lot of labor. And how we respond to that, it seems, is going to be an increasing challenge going forward. RADDATZ: And quickly, Bill, a good move, in the end? KRISTOL: I don't have a clue. KRISTOL: But you know what? Not government money. It's not taxpayer money. He is taking the risk, and his shareholders will pay the price if it isn't a good move. But that's capitalism. RADDATZ: Thanks very much. Tom and Cory, thanks to you both. Bill is stick around to join the powerhouse "Roundtable." They're ready to go on all the week's politics, including the minimum wage debate, plus new details on trailblazing NFL prospect Michael Sam. Back in just two minutes. MICHAEL SAM, NFL PROSPECT: I know how to handle myself. I know how to communicate with my teammates. I know how to communicate with the coaches. If someone wants to call me a name, I will have a conversation with that guy and hopefully won't lead to nothing else. RADDATZ: That was trailblazing college football star Michael Sam at the NFL Combine this weekend where teams check out the top draft prospects. And we'll get into a big controversy brewing in Arizona over gay rights and the Super Bowl, in a moment. But first the "Roundtable" is here. 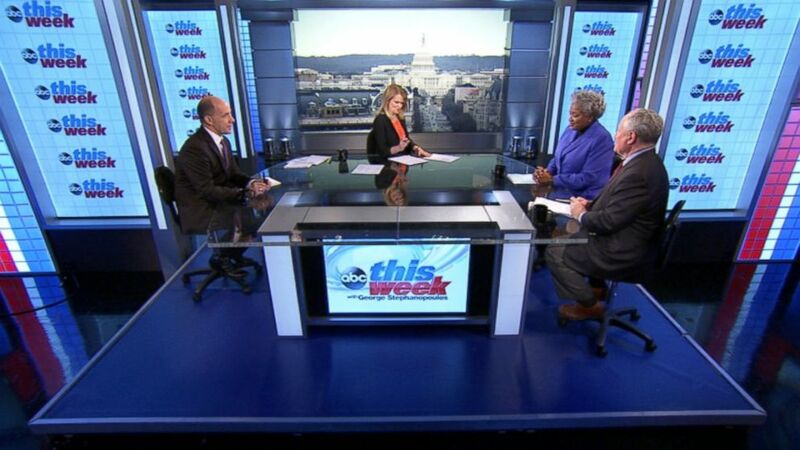 Bill Kristol is back, along with Democratic strategist Donna Brazile, and ABC's Matthew Dowd. I want to start with the minimum wage, a big story this week, conflicting headlines that came out of the report about minimum wage from the Congressional Budget Office. They analyzed the Democratic proposal to raise the federal minimum wage by $10.10 -- to $10.10, and they found doing so could cost as many as 500,000 jobs, but it would also pull 900,000 out of poverty and raise wages for at least 16.5 million people. So, Bill Kristol, Republicans and Democrats both saw something here to make their arguments on minimum wage. What did you see? KRISTOL: I think both are probably right. If you increase a lot of people's wages, they will have more money, but some people won't be affordable to employers. And so it's a trade-off. I think there are better ways to help people who are working, who are at the bottom of the ladder, so to speak, in salaries, than to raise the minimum wage and impose that on precisely the employees who are hiring those people. You can do the -- expand the Earned Income Tax Credit so everyone subsidizes those who are working at the bottom levels. You can reduce the payroll tax, which takes a big hit out of people who are working at the bottom levels. I don't think the minimum wage is the right way to do it. But I do think it is reasonable, and conservatives have to be serious about this, to think about how to make work pay. RADDATZ: Matt Dowd, what matters more here? Potential job losses or wage increases and pulling people out of poverty? MATTHEW DOWD, ABC CONTRIBUTOR: Well, we've now gone whatever the amount of time is, 25 years, where the level of poverty in this country is at a level of which nobody is satisfied with. And I always -- when we talk about the minimum wage, one of the things that I focus on is, we've had a change of productivity in this country where the productivity in this country has been dramatically increased, so workers are producing more. But they're not getting paid more. Minimum wage people that produce more aren't getting paid more. So all of the benefits that have flowed from productivity have gone either to CEO pay or to Wall Street. If you gave workers the same equivalent of productivity levels, they would make $18 an hour. That's what the minimum wage would be. And I think in the end, we -- I think that there is plenty of -- if you look at the wanted ads, you look at the computers, look at all the things, there is plenty of ask for minimum wage jobs, even if at $10 an hour, in the end we have to do something where people are making a living wage where they can afford daycare, afford school, afford all those things. And we're not at that level. RADDATZ: And Matt is really talking about what I know you think as well. This really does impact Americans every single day, this minimum wage issue. BRAZILE: You're talking about people working nursing homes, retail shops, fast food places. Raising the minimum wage would raise their standard of living. This debate is really about whether or not we want poverty wages in our society or a living wage so that the American people can afford to go grocery shopping. I was amazed that the wage for tip workers is $2.13. Now when I was a waitress it was $2.13 two decades ago. It has not moved. And so there's arguments, somehow, that you know this will somehow or another put people in the unemployment line. I think it's a bogus argument. It will raise the level of living for every American. RADDATZ: But does it go anywhere? BRAZILE: You know what's going to happen is that the governors are going to do it -- Governor Inslee is looking at raising the minimum wage. Here in the District of Columbia, the mayor and the city council, Montgomery County right outside here, they raised it. And you know what, we're not experiencing job losses here. DOWD: Well, Martha, let me just say something, because it's a continuation of the conversation that you just had about WhatsApp. WhatsApp, 55 employees, as you said, that it gets valued and gets bought for $19 billion. There's companies in this country that have thousands and thousands and thousands of employees that are trying to pay people a decent wage that get valued way less. Something is off in our country. And something is off where we evaluate companies like this -- not companies that hire lots of people at lower levels, but we value companies like this. I think at some point we have to look at how we value companies, because it's totally distinct for how people are living in this country. KRISTOL: But raising the minimum wage burdens precisely the restaurants, the grocery stores, the people who do have very thin profit margins. Do you want to help the working poor? I'm fine with that. Let's tax Mark Zuckerberg, let's tax Facebook and WhatsApp, but the minimum wage is an inefficient way, an ineffective way to help the working poor. BRAZILE: Wal-Mart -- can I say about the Wal- Mart? BRAZILE: If you raised the workers' pay at Wal-Mart it will cost one penny to buy a DVD, one penny. You're not talking about a lot of money. But it will help those ordinary people pay their bills. RADDATZ: I want to quickly move to Social Security, the budget, a big political headline this week. President Obama apparently will not include proposed trims to Social Security in his budget proposal next week. He'll push for increased investments in education, job training. Sounds to me like any hope of a grand bargain is dead. KRISTOL: You know, I differ with a lot of my Republican friends. I don't even like the kind of trend that was being talked about in Social Security, because it affects everyone the same. If you want to fix those -- if you want save money for Social Security means test it. This is not hard. Mark Zuckerberg, or Mark Zuckerberg's parents or Ross Perot, whatever, do not need a rise in Social Security benefits, the people at the bottom end do. But no one is willing to talk about it. RADDATZ: I want to go around very quickly, our last thing the Arizona law. The controversial law passed by the Arizona legislature that would allow businesses to deny service because of religious beliefs. People think it is targeting gays. And there's one little twist here, the Super Bowl is scheduled to be played there next year. If Governor Brewer signs this into law, should the NFL take action -- Matt Dowd, very quickly. DOWD: Well, first, I think in the end Governor Brewer is probably going to veto this, because it seems like an easy veto for her to do, because everything that's going on in the business economy there. This is one of those problems when people use religion as a way to sort of enforce discriminatory practices. People use religion back in the 1860s when they defended slavery. They used religion to defend slavery. We've used religion to go to war. People have criticized Islam because they use religion to fight people and kill people. This is a problem that in the end I think she vetoes it, because there's no way this can survive. BRAZILE: Hallelujah, I hope you're right. RADDATZ: Now she knows how to talk quickly. She knows how to do it. Lots more roundtable ahead, plus our exclusive conversation with former President George W. Bush. But first our powerhouse puzzler, let's see how the roundtable does with this question, "who is the only Ukrainian to ever win the gold medal in Olympic women's individual figure skating?" Back in just two minutes to see if the roundtable and you can guess the answer. ANNOUNCER: This week with George Stephanopoulos brought to you by AT&T. RADDATZ: Our puzzler, "who is the only Ukrainian to ever win the gold medal in Olympic women's individual figure skating?" Let's see if anyone guessed the right answer. DOWD: I don't the spelling Oksana Baiul? KRISTOL: I'm too depressed by what happened in ice hockey to actually discuss any other sport that happens on ice, but wasn't there some Olga person who was a great women's figure skater? BRAZILE: I know basketball, I know baseball, I know track. I have no idea. So whodat (ph)? RADDATZ: Well, guess what Matt Dowd, the answer Oksana Baiul. Remember, she beat out American Nancy Kerigan in 1994 to win the gold. Think you can puzzle the roundtable? Tweet us @ThisWeekABC using hashtag #teamwpowerhousepuzzler. Up next, former President George W. Bush in just 90 seconds. RADDATZ: Now our Sunday spotlight shining on President George W. Bush speaking there at a forum I moderated this week at the Bush Institute. And afterwards, a rare conversation with the former commander in chief who has made it his mission to avoid the limelight since leaving the Oval Office. RADDATZ: He has stayed as far away from politics as possible, making headlines for staying out of the headlines. No comment on the issues. GEORGE W. BUSH, 43RD PRESIDENT OF THE UNITED STATES: A lot of people ask me, you know, do I miss much about being president? The answer is really no. RADDATZ: Former President George W. Bush is still making some big-time appearance -- here tossing the coin at a season opener for his beloved Dallas Cowboys -- but mostly it's been tackling his new passion, oil painting, or golf and good causes. Sometimes golfing for good causes, like America's returning veteran. BUSH: Up to this point in time, we have honored our vets through sporting events, riding mountain bikes or playing golf. RADDATZ: But the president decided that wasn't enough for the men and women he sent to war, this week announcing a massive study of post-9/11 veterans through his George W. Bush Institute and Syracuse University on how to reintegrate returning veterans into the civilian world and workforce. The former president and I sat down in Dallas, joined by veteran and non-profit entrepreneur, Jake Wood. BUSH: We've got a problem. Too many veterans are unemployed. And there's what we call a civilian military divide. In other words, the returning vets think one thing, the civilian population thinks another and our aim is to get people to understand each other better for the good of the veteran community. JAKE WOOD, TEAM RUBICON: Veterans are simply looking to be understood. They're looking to be challenged. RADDATZ: Wood is the perfect example. A former Marine Corps squad leader in Iraq and sniper in Afghanistan, he returned home to cofound Team Rubicon, a non-profit made up of veterans and doctors who respond to disasters at home and around the world, from the Philippines to Oklahoma, putting the skills they learned in combat -- logistics, team-building and problem-solving -- to work. But Wood says more needs to be done for the tens of thousands of veterans looking for work. WOOD: There's an opportunity for organizations like Team Rubicon, like Mission Continues, to provide veterans with perhaps that sense of purpose, that sense of mission that they had while they had the uniform on. RADDATZ: For President Bush, knowing the great cost of these wars, 6,800 American service members killed and 51,000 wounded, this new initiative to help returning veterans helps him, as well. (on camera): I think all of us -- and I'll include myself in that -- feel deeply about veterans. But for you, Mr. President, it has to help you cope with what happened in those wars? BUSH: Oh, no question it helps. I mean I -- yes, I have a -- I have a duty. You know, obviously, I get slightly emotional talking about our vets, because I have an emotional -- I'm in there with them. But I'm also -- my spirit is always uplifted when I visit with vets. As I say, there's no self-pity. We've got a society that's incredibly comfortable and too many people saying, oh, man, woe is me. Not our veteran community. They don't say woe is me. They say, what can I do to continue to serve? RADDATZ (voice-over): A warrior and his old commander-in-chief, shaped by the same wars, now reunited by a new struggle. WOOD: How can we bring civilians and military service members together to share these stories so that there's a mutual understanding, so that as a nation, we can heal together? BUSH: So here -- here -- here's a -- what -- what the country will ultimately understand, that one of the great resources we have in our nation is vets such as Jake. He chooses to join the United States Marine Corps and serves in combat in two theaters. That's a pretty unique person who's willing to take that kind of risk and to make that kind of sacrifice. Well, those are characteristics which are hard to teach. BUSH: Our mission here at The Bush Center is not only to remind people that we have a duty to our vets, but to make sure that when they exercise that duty, it's done in an efficient way. Jake, for example, I'll make a pitch for him. He does good work. Support his program. WOOD: Hey, that's -- that's a good endorsement. RADDATZ: Back now with the roundtable. Bill Kristol, Matt Dowd, you both have sons who served in those wars, the war in Iraq, Afghanistan. The country is war weary. I know the president has great hopes for this study working and joining up vets with the workforce. But how do you keep the country interested? How do you go forward with this? UNIDENTIFIED MALE: Well, the country is war weary, but they are deeply respectful of what our veterans have accomplished. And I think they also understand that veterans don't want pity, that they might want a little help reintegrating into the civilian workforce. And I think that's happening an awful lot in the private sector. An awful lot of people in the military and out of the military are thinking about this. And I'm glad that President Bush is taking it on, as well. RADDATZ: Do you worry about the future for our veterans, as the country forgets these wars? UNIDENTIFIED MALE: Well, yes, I worry very much for them. I -- as you know, Martha, I've been very critical of the president in the past having served him and having served in the two campaigns, was very critical of him, and in the wars and all that. But I do have a son in that. I think the president has done yeoman's work on this. You can tell the president's heart is very connected to this. I had a son who was fluent in Arabic, served in Iraq. He came back here and the job he has now, he runs the operations for a charter school in the projects in Brooklyn. Nobody in the military helped him get that job. Nobody in government helped him get that job. He got that job on his own. The problem we have is every department is siloed. The Defense Department is siloed. The Labor Department is siloed. The Commerce Department is siloed. And these vets, as the president said, have characteristics that people don't see. They don't need to go into a security job, they can go into a leadership job in a company. RADDATZ: -- those two things. RADDATZ: -- that's definitely what they're looking at, too, at The Bush Institute. RADDATZ: And, Donna, very quickly, I just want to see how you feel about the reputation of George Bush after that war. Has the public softened on him when he does things like this? BRAZILE: There's no question, like many presidents after their term in office, the American people get to see another side of them. BRAZILE: -- are also doing that work. RADDATZ: That's exactly right, Jill Biden was at this summit, as well. We'll be right back, after this. RADDATZ: And now, again, we honor our fellow Americans who serve and sacrifice. RADDATZ: This week, the Pentagon released the name of one Marine killed in Afghanistan. RADDATZ: That's all for us today. Thanks for sharing part of your Sunday with us. Check out "WORLD NEWS" with David Muir tonight. And before we go, a shout-out to our newest viewer, Liam Gerard Alexander Zachary. There he is with proud mom and THIS WEEK producer, Kate McCarthy. Liam was born Tuesday. Give him a few days and he'll be ready to join the roundtable. Our best to Kate, her husband, Drew, and, of course, little Liam.